he amphitheatre served many purposes. It could be a stage for actors performing popular plays of the day A platform for speakers giving readings of the classics. A musical afternoon was also an attraction. 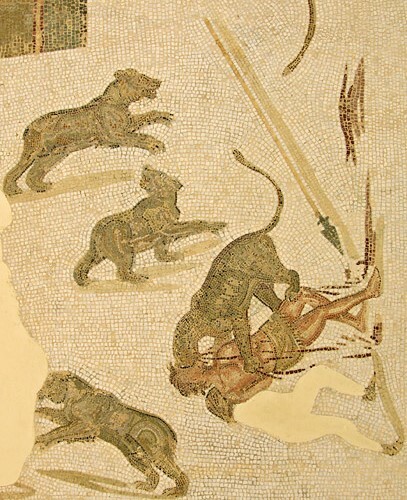 But it was designed primarily to satisfy the Roman desire to see the brutal slaying of both human and animal. Although there were battles of human against human, most of the contests in Britain involved human against a wild animal. But there were places in the larger towns where the ultimate gladiatorial battles too place. The traditional layout was to have a stage at the back which would be the setting for plays, renditions, musicians etc. In front of this would be the main area, shaped in the form of a half circle. The surface was a thick coating of sand. This gave the contestants better grip and was easy to remove after a days entertainment, along with all the blood that had soaked into it. On three sides of the arena was a sloping bank with steps arranged in rows. This was the seating area for the spectators. Prior to the main events were the 'warm up' performers. 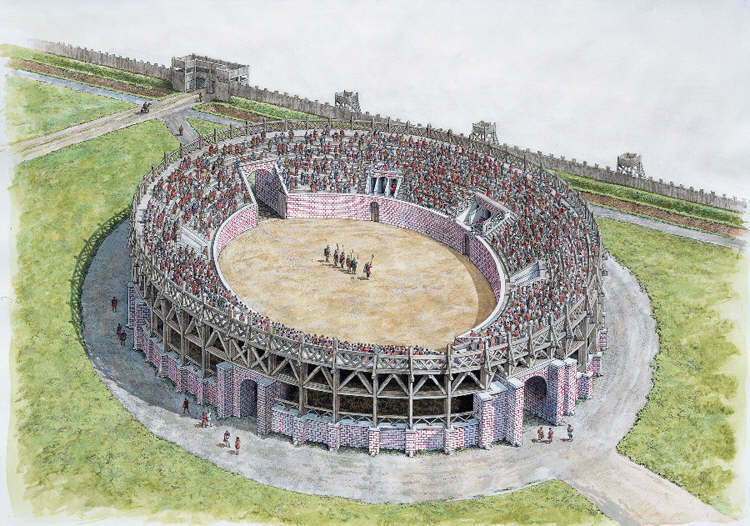 A typical day at the amphitheatre would start with acrobats or circus performers who would keep the crowd entertained while they shuffled in, finding a vacant seat, very often carrying their snacks and drinks. To whet the appetite, the next part of the show would be a bit more violent and consist of one or more boxing matches cockfighting, or animal baiting displays. The boxing of Roman times was nothing like the strictly controlled contests we see today. The participants would wear a leather long strap around their hands and forearms which had metal studs embedded into the material. There were no rounds or rules about where to hit an opponent. There were no gumshields or any sort of protection. The fight continued until one of the boxers was unconscious, dead or raised his arm in a gesture of submission. To submit would be an act of cowardice in the eyes of the crowd, who had come to see blood, and plenty of it. On raising an arm the crowd would frequently pelt the arena with anything that was to hand. The Romans believed in death of glory, even in their 'games'. So the lesser of the two would most likely fight on risking, permanent injury or death rather than lose face in front of so many people. Believe it or not, the Romans actually turned an execution into a public game. Those who had committed crimes against the state, which included Christians who were seen as 'underminers of imperial authority' faced a horrific death. They were condemned Ad bestias — to the beasts. They would either be tied to a stake, or thrown weaponless into the arena where a starving, angry wild animal would be released. The crowd would lean forward in anticipation of the gory event and as the animal torn the human apart, they would cry out in elation as the internal organs were ripped out and strewn across the sand. Once it was all over, they would sit down and await the next event while discussing the best parts of the match. Before the start of the gladiatorial bouts everyone had come to see, there were contests between up and coming gladiators and wild animals such as wild boar and wolves. Whichever side won, there would be a tremendous roar of approval as the fatal blow was struck. After which the winner (if human) would bow to the audience and depart the arena. The body of the loser would then be removed and the arena prepared for the next bout. By now the spectators were well and truly hyped and ready for the main tournaments. Gladiator against gladiator — to the death. No-one chose to become a gladiator, as the life span was obviously very short for most of them. Gladiators were selected from slaves, criminals and prisoners of war. This was their only real chance for glory and recognition. 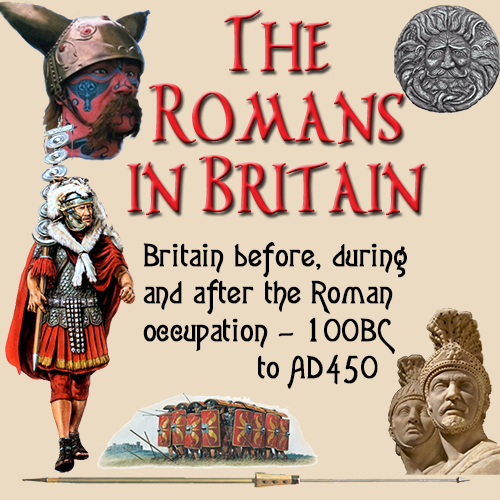 It was suspected that women fought in the arena as well as the men, and it was in the summer of 2000 that the Museum of London provided proof that this did happen.. Remains in a gladiator's burial plot showed that a female body was buried there along with some of her possessions. In the battle the contestants would wear special armour. A helmet, face mask, body protection and a shield were the basic means of defence. The sword arm would be padded, as would the leading leg. Weaponry would be a personal choice. A sword and dagger for quick thrusting attacks. or a net and trident for strategic assaults. The net would either be thrown to disable the opponent, or used to tangle his sword and so wrench it from his grasp. The trident would be used to lunge a killer blow while the adversary was engaged in trying to untangle himself or his weapon from the netting. Battles were fought to the death and as before, submission was signaled by a raised arm, which was not popular. 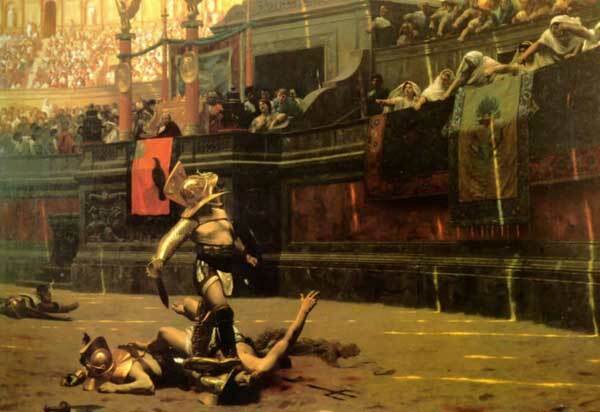 When a gladiator was pinned to the floor, it has been common belief that a thumbs up or thumbs down signal from a leading figure attending the event sealed the fate of the loser. It is very doubtful that this was the case and it is generally thought that the battle would continue until one of the competitors was fatally wounded. The contests were not a pretty sight. The gladiators would slash and hack at each other inflicting severe wounds that would cripple parts of the body or limbs. Each strike would cause the audience to stand and shout encouragement to the fighters. The longer the fight continued, the better they liked it. In the ensuing struggle it was inevitable one gladiator would be maimed so badly he would be lying on the sand, maybe with a dismembered hand or forearm lying nearby. The remaining gladiator would walk in circles around the other shouting and waving to work the crowd up into a frenzy, who were all baying for blood and anticipating the kill. In the final act, he would approach his opponent, stand over the exhausted blood stained mutilated body and deliver the fatal strike. At this point the spectators would go into total euphoria screaming and shouting. Some would pass out with excitement. With the battle won, the victor would bask in the accolade of the crowd and depart the arena to fight another day.